Last night I started an outstanding book by J.V. 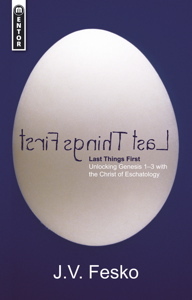 Fesko, Last Things First: Unlocking Genesis 1-3 with the Christ of Eschatology. A few friends on Facebook kept recommending the book, so I finally broke down and got a copy. It’s really an amazing book. Check out the quotes and information and get a copy! We think that we know the first three chapters of the Bible well ” Creation and the Fall, we say, knowingly. But have we ever stopped to consider that Jesus in the book of Revelation is called “the last Adam” and the “Alpha & Omega—? Should this make a difference to how we look at the first three chapters of Genesis? Dr. John Fesko says that it does and that without seeing Christ and the end days, we cannot understand the first days. Dr. J. V. Fesko is an Adjunct Professor in Systematic Theology at Reformed Theological Seminary in Atlanta. His Ph.D. in Theology is from the University of Aberdeen in Scotland. He has a MA in Theology from Southwestern Baptist Theological Seminary, Fort Worth, TX and a BA from Georgia State University. In addition to teaching at RTS, Dr. Fesko is the pastor at Geneva Orthodox Presbyterian Church in Marietta, Georgia.